Tarantella I - “ how it all started 40 years ago"
Back in November 1966, Pekka Koskenkylä, the founder of Nautor, arrived unannounced at the office of Heinz Ramm-Schmidt. Without a word, he put a large-scale drawing on Heinz Ramm-Schmidt's desk. Heinz looked at it for a long while in silence. Finally Koskenkylä asked his opinion about it. The spontaneous answer was: "I's a winner!" The boat on the drawing was the Swan 36, one of the first yachts with the separate rudder configuration. "It's yours; I know you need a boat". Heinz replied he wasn't purchasing any boat in the first place and, if he was, it would be a boat in the half-ton size, and this was a one-tonner. Koskenkylä replied: "I suppose it's OK if you get one ton for the price of a half!" Heinz was not prepared to sign a contract on that occasion, but arriving home on the evening before Christmas Eve he found Koskenkylä in his kitchen, selling the concept to his family! When signing the contract Koskenkylä confided that this meant three orders for him, as two other customers had stipulated they would only sign an order if Heinz Ramm-Schmidt would do so first. Rod Stephens had stipulated, besides other conditions, that Koskenkylä would have to confirm at least three orders before he got permission to use the design for production. 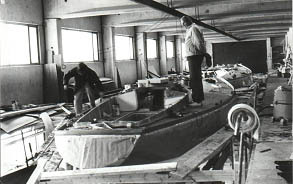 The Ramm-Schmidts were due to get their new boat on the first of May 1967, but the boat wasn't finished until Mid-July, in spite of the fact that the family spent all their week-ends at the yard, taking active part in the building of the boat. The lead-up to the launch was long and winding for the first Swan. When casting the 3.6 ton lead keel the concrete mould was too fresh, so that when the lead was poured it collapsed and all the lead flowed on to the ground. When the boat was finally ready for launching, the birch alley on the way to the port was too narrow; the men from the yard finally had to cut down all the trees on one side! More problems arose as the chassis of the home-made trailer broke, probably as a result of the contact with the birches, and the boat fell into the ditch! With assistance of the village blacksmith the boat finally arrived at the port next morning. As a fact, the boat was no way ready yet, and a lot of fixing was still needed. Almost immediately after leaving the port under sail in heavy wind, the boom and the expensive wind-indicator came loose. In spite of all the difficulties that appeared to be due to lack of experience of sailing, Pekka Koskenkylä managed to achieve a very high quality of build in a short time. This was due to his capacity of spreading his enthusiasm to his team of skilled workers. The outstanding joinery skills of Rurik Riska were evident in the impeccable wooden interiors of the yachts. Nautor also made good use of external knowledge. Their US agent, Palmer & Johnson, sent their own man to supervise the quality and strength of the build, contributing in his own personal way. Weighing a hefty 120 kgs (265 lbs), he jumped on all parts he thought looked suspicious and he rejected every item that didn't pass the test! As a result, some items were over-specified and the boats from this period were heavy. But, fortunately, they have lasted well all these 40 years. Pekka Koskenkylä was a pioneer in modern serial production methods, which kept the manufacturing prices down. Thus the company was reputed to build Rolls-Royce quality at Mercedes prices. But much of the high reputation regarding quality and durability was gained through the co-operation with the Stephens brothers. Rod Stephens himself took part in the first regatta on board the new Swan 36 Tarantella. He spent quite a lot of time at the top of the mast with a note-book in his hand. Heinz Ramm-Schmidt learned much about off-shore racing from this event. 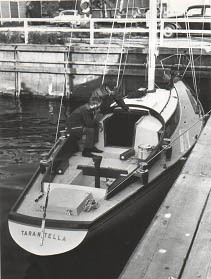 Launch of Tarantella I at Alholmen on 15.7.1967. Although Tarantella was a success she had some faults, being the first of the series. When discussing with Heinz Ramm-Schmidt some major repairs that would have to be done at the yard, Pekka Koskenkylä suggested: "Sell your 36. For the price you get, I'll build you a new 37!" This generous offer was accepted. The new Swan 37 superseded the 36 as unbeatable in racing. Tarantella II, hull number 16, was the first example launched, and an immediate success. Today, 37 years later, we wondered how it was possible for a yacht to be that successful over such a long period of time. Heinz's answer was that you need to be good over-all. Of course, first you need a good design. The importance of a good sail wardrobe is crucial. (In the early seventies you had to purchase your sails from the US, Hood or North, or from Ratsey & Lapthorn in the UK.) The racing sails are only used for racing. And the bottom of the boat has to be cleaned and polished before every major event. The tasks on board are shared in order to take advantage of everybody's personal skills. Somebody is good at the helm sailing up-wind, somebody else down-wind; somebody is talented at trimming sails etc. As soon as anyone is noted not to perform at 100% concentration, because of fatigue, he is replaced by someone who is fresh. Immediately after the start, everyone who is not needed is sent below for sleep. At night more hands are needed on deck. In day-time boats perform similarly; the differences are biggest at night. Personal equipment is minimized and all spare gear stripped out of the boat. Food and water consumption is calculated in advance. All equipment is concentrated amidships. Altogether the fighting spirit among a good crew, knowing that everything has been taken into consideration and each person must make their contribution to being the winners - that makes the difference!